Are Elephants More Compassionate than People? With 1.2 billion people in India, space is at a premium. A growing population, means less land for animals, quite the conundrum since this is also home to the largest land mammal on Earth. As elephants follow routes they’ve traveled for decades, villages crop up in their paths forcing elephants and people closer together, often resulting in a deadly battle for survival. Under pressure from higher population densities, interruption of their normal routes, and lack of fodder, elephant populations are increasingly turning to crop raiding for sustenance. They can easily destroy a farmer’s livelihood in a matter of hours. With their homes and earnings on the line, villagers will go to any means necessary to keep their families safe. Villagers fight back with electrocution, shooting, poisoning and hakka patas (a mixture of explosive matter, lead and iron made into a ball, which is inserted into a cucumber or a pumpkin). A baby stands by his mother, who died from a hakka pata. 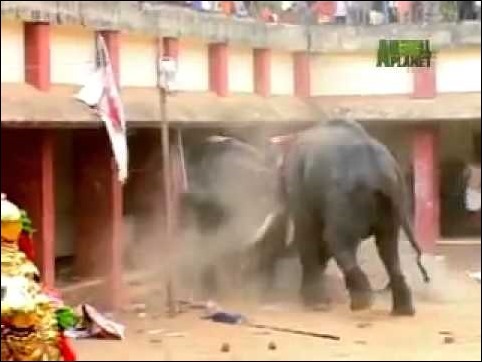 Human/elephant conflict is an epidemic in India. In fact, up to 20% of elephant deaths in India stem directly from crop defense. But people are not the only ones who are frustrated and concerned with protecting their families. Elephants are fighting back. They’ve been known to destroy not only the crops, but homes, schools and parts of villages. In one such recent attack in West Bangal, an elephant crashed through the wall of a home. The family, who was eating dinner, ran to the area of the attack to find an elephant standing over their baby, with pieces of the wall lying about. The elephant began moving away until the baby began crying. The elephant returned to the baby and using its trunk, gently removed the debris from around the baby. He then moved off, back into the forest. Amazingly, this is not an isolated incident. Six months previously an elephant herd carefully removed a little girl from harm’s way before smashing several houses. So while both man and beast are vying for space, and warring for survival in an ever-shrinking world, it seems at the heart of it, the elephant is the better species. With a gentle nature and knowing spirit, even the “beast” senses the innocence of a child. When elephants consume hakka patas, the food explodes in their mouths causing pain, an inability to eat or drink, and ultimately a slow and painful death. 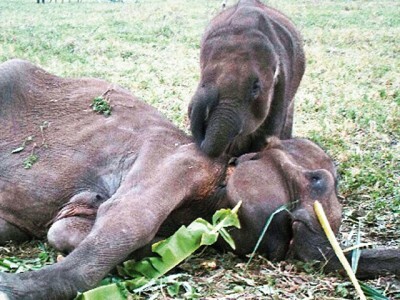 Adult elephants are usually intelligent and experienced enough to identify the deadly meal as a trick, but juvenile and baby elephants often fall victim to the traps. It is a cruel way to go. Is this–the title of this post–a “trick question”!? Too cruel. Educate the people and assist them in protecting their villages in a humane manner.